The Employer Council of Champions (ECC) hosted its fifth annual Summit on March 6 and 7 on the theme “Diverse Talent: Taking it to the Top”. During the two-day event, more than 200 participants, including business and civic leaders, human resource managers, representatives of immigrant serving agencies and other community stakeholders came together to exchange ideas, share success stories, and hear from leading experts and practitioners in diversity and inclusion in the workplace. 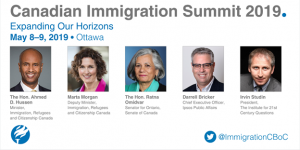 This year’s Summit also provided an opportunity to acknowledge and celebrate the achievements of the ECC and Hire Immigrants Ottawa over the past five years. The Summit also featured the 2012 Employer Excellence Awards. In their remarks the Co-Chairs of the ECC took stock of the work of HIO and the Council, referring to the thousands of new immigrants Ottawa will receive in the years ahead and the incredible opportunity this represents for the city. They stressed the essential role of employers in making Ottawa the destination of choice for global talent. “We need to reach out to our networks and increase the number of employers who know how to effectively tap into this diverse talent… how to take full advantage of the energy and innovation that diverse work teams and diverse leadership can bring to our businesses,” said Dennis Jackson, Vice-President, Scotiabank, Ottawa and West Quebec, and ECC co-chair. “As business leaders and directors we have an important role to set the tone from the top and to influence the culture of our respective organizations if we are to reap the full benefit of diversity. That includes increasing diversity at the very highest levels of the organization,” said Hicham Adra, President, Ardan Fitzroy Enterprises Inc. and ECC co-chair. Mayor Jim Watson assured the audience that the City is in full alignment, and is proud of its efforts to promote diversity and inclusion, both as an employer and as a municipal government. Trevor Wilson, a Human Equity Strategist and author of the highly acclaimed book Diversity at Work: The Business Case for Equity, delivered a stimulating and inspirational keynote address focused on the central and essential role of leadership in the on-going process of creating inclusive and equitable workplaces. Employers who are successful in building equitable and inclusive organizations are, in Mr. Wilson’s view, employers of choice for all. But what kind of leadership is required to achieve such a result? According to Mr. Wilson, the competencies that define equitable leadersinclude such things as openness to difference, accommodation, ethics and integrity, and commitment to diversity. These leadership competencies are by far the most important factor in creating inclusive environments, and in fostering and supporting change throughout an organization. Kate Morican of Deloitte provided the employer perspective, noting that diversity and inclusion measures are imperative to the success of a business and, as such, leaders should be “relentless” in their commitment to those measures. The Breakfast of Champions was emceed by the CBC’s Adrian Harewood, who received a surprise Community Builder Award from United Way Ottawa. At the Summit’s Learning Exchange, Alice Kubicek of akpsGlobal ably guided participants through a series of informative, thought-provoking and interactive presentationsand table discussions. In her keynote address, Catherine Lyons-Bozzo of Manpower highlighted major trends impacting the world of work, future environmental forces and challenges currently facing businesses, and the employer-initiated solutions that should be considered to address them. An expert panel discussion featuring Susan Haywood of Human Resource Blueprints Ltd and Kate Morican of Deloitte, underscored the need to move from simple notions of diverse workplaces to the more essential and meaningful concepts of inclusive workplaces. Jan Michaels of HRSDC led participants through an interactive audience polling exercise to reflect on the often overlooked difference between diversity and inclusion—inclusion is not a given; it is a choice we make, both as individuals and as organizations. The speakers presented concrete tools and approaches for embedding diversity and inclusion within strategic business objectives, and for changing individual and organizational behaviours. The Learning Exchange was capped off with a newcomer success story by Kenny Leon, Senior Communications Manager with the Ottawa Chamber of Commerce, who shared his personal experiences and insightful reflections as an internationally trained professional and newcomer to Canada contributing to the Ottawa workforce. Ottawa-area employers were enjoined to continue to commit themselves to building on the considerable momentum that has been generated in the city around the issue of integrating immigrants into the workforce.